﻿ Ky Hoa Dalat Hotel (Vietnam) | FROM $8 - SAVE ON AGODA! 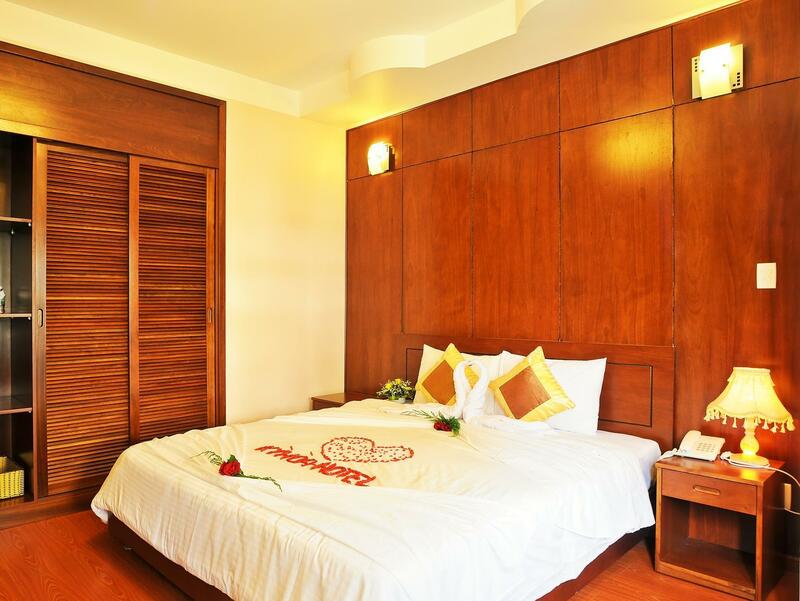 Have a question for Ky Hoa Dalat Hotel? 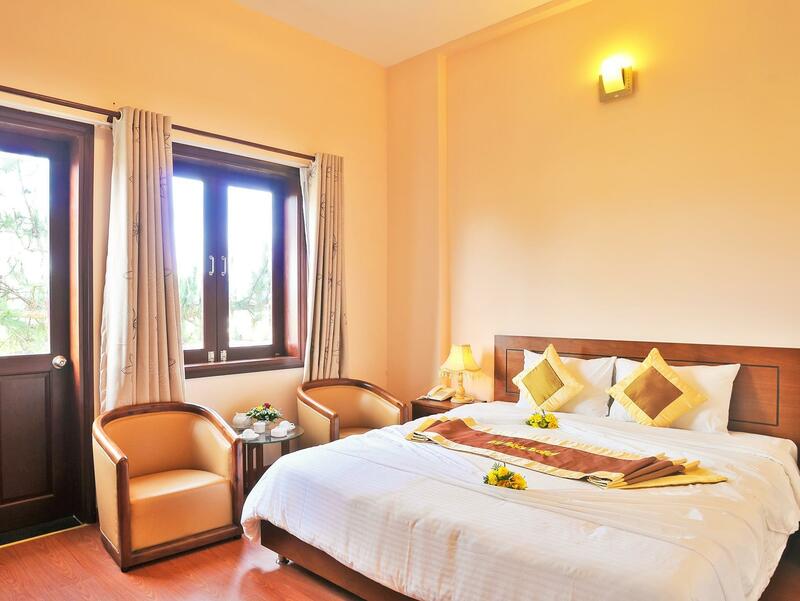 Designed for both business and leisure travel, Ky Hoa Dalat Hotel is ideally situated in Cam Ly Falls; one of the city's most popular locales. From here, guests can enjoy easy access to all that the lively city has to offer. Also within easy reach are Statue Of Golden Buddha, Dalat Palace Golf Club, Trung Tam Y Te Da Lat. 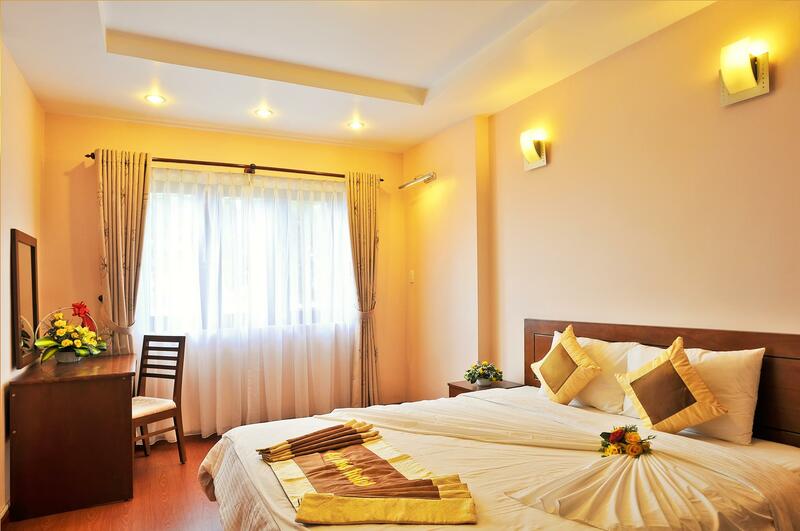 Ky Hoa Dalat Hotel also offers many facilities to enrich your stay in Dalat. This hotel offers numerous on-site facilities to satisfy even the most discerning guest. All guest accommodations feature thoughtful amenities to ensure an unparalleled sense of comfort. Whether you're a fitness enthusiast or are just looking for a way to unwind after a hard day, you will be entertained by top-class recreational facilities such as garden, karaoke. 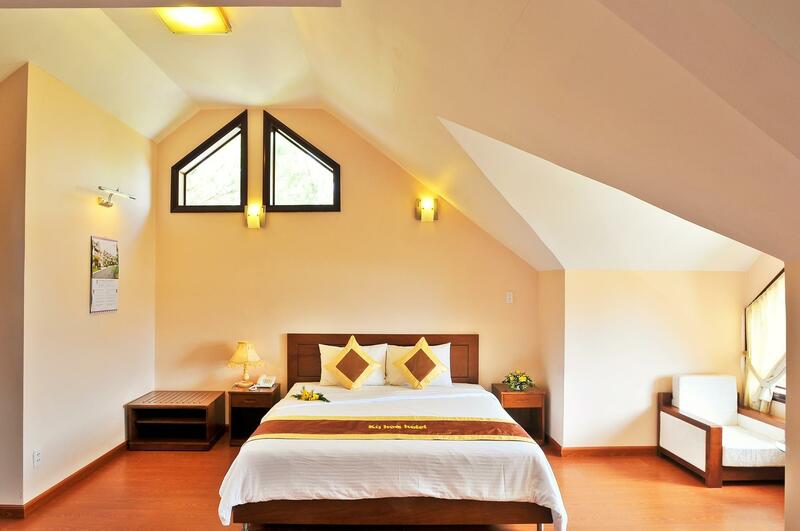 Discover an engaging blend of professional service and a wide array of features at Ky Hoa Dalat Hotel. Would highly recommend to those who want a good,clean room. It is also perched on top of a hill with fantastic views. For the rate that you get it's worth every dollar and breakfast was not too bad either with a good spread. Reception can also speak in english and they go all the way to help you. However, it's far from town and not walking distance to the market and food outlets. 5 stars for you! It was amazing! Great hotel & valuable. I booked this hotel via Agoda for one night and then we decided to stay for another night but if we booked with the reception, we had to pay more so you guys have to book via Agoda again for the same price! After a little trouble checking in, we settled in and enjoyed our stay at Ky Hoa. We booked a deluxe. That being said, the hotel is very nice, clean, comfortable and spacious. If you have the right room, then you get really nice views of the surrounding valley. The location is a bit far from town, so do plan to have your own transportation (i.e. motorbike or something like that) if you stay here. Otherwise, you'll spend most of your time in the hotel, which if you're looking for a quiet getaway, isn't necessarily a bad thing. I still recommend this hotel for a quiet getaway, it's pretty nice for the price you pay, and doesn't need to be advertised in this way to attract people to stay here. Restaurant didnt served us dinner because we didnt make reservation.Breakfast was poor and staff wasnt helpful. Receptionist and room attendant were nice and helpful. Most of the costumers are vietnamese there. We were a group of 7 Austrians. All of us enjoyed the stay. The hotel is in a quiet location. To go to the town center a taxi or motor bike is recommended. Despite a non refund policy for cancelling a day with less than 3 days notice, the hotel was extremely cooperative and allowed us to shorten our stay from 3 nights to 2 nights without charging for the third day. We would stay in this hotel again. A nice hotel a little way out of town although it can be a good walk if you choose but a taxi is cheap as an option. The staff when we were there didn't have a great deal of English but then again we didn't have a great deal of Vietnamese but they did try and help when possible for assistance to book our onward travel. Big room with what would have been a nice view however these days all you see are the green houses that are seemingly everywhere. The ease of getting around was always a short ride or walk. I arrived late but staff were very accommodating given limited English. I was made to feel welcome. Due to language difficulties unless you knew what you wanted to do it wouldn't have been easy that said if you went with the flow it was fantastic...breakfast limited but fine. I had a fantastic short stay and got to do many wonderful things. this hotel is a short cab ride from the town centre. our room was spacious with a good bathroom and a balcony with views across market gardens to the hills in the distance. my wife found it a little sterile in atmosphere but it was very suitable as a base while in dalat. the staff had very little english but responded to our attempts to use our vietnamese dictionary with good humour and we were able to communicate effectively. breakast was a bit limited for western tastes but good if you like to try the local options. we ate in town for most meals. 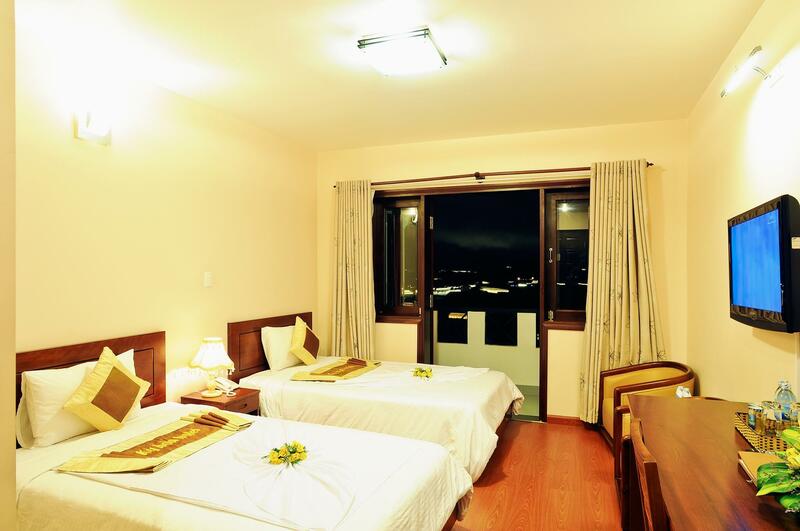 Nice rooms (superior room) with comfortable bed, balcony with street/hills view, lcd, etc. Room was spacious, clean and comfortable, we enjoyed our stay. Good breakfast buffet with lots to choose from if you go early enough. Hotel is a little ways from the city center, we rented a motorbike otherwise hotel is not accessible to Da Lat marketplace area. Clean rooms, great showers, quiet location for a god night sleep. When we checked in we found the hotel staff very friendly and helpful as we were travelling with my father who is 83 and needs some special considerations. The hotel staff were more than willing to help despite the language barrier ( some staff could speak some english ) . We came during the quiet season and had the hotel mostly to ourselves this was great for service and breakfasts as we could order anything we liked but if we wanted dinner in then tis had to be done via special arrangement. We had the Superior rooms and found them to be very comfortable and clean with great showers. In closing I would have no hesitation in recommending this hotels as a place to stay. We had a great time here in the hotel, the internet is fast and also the service. The hotel has a vast garden around and so far away from the noisy streets. Good price for the convenience the hotel brings. It was great to spend a weekend far away the noisy streets. The hotel is surrounding with beautiful garden and lots of blooming fllowers. Quiet but not far from city center. 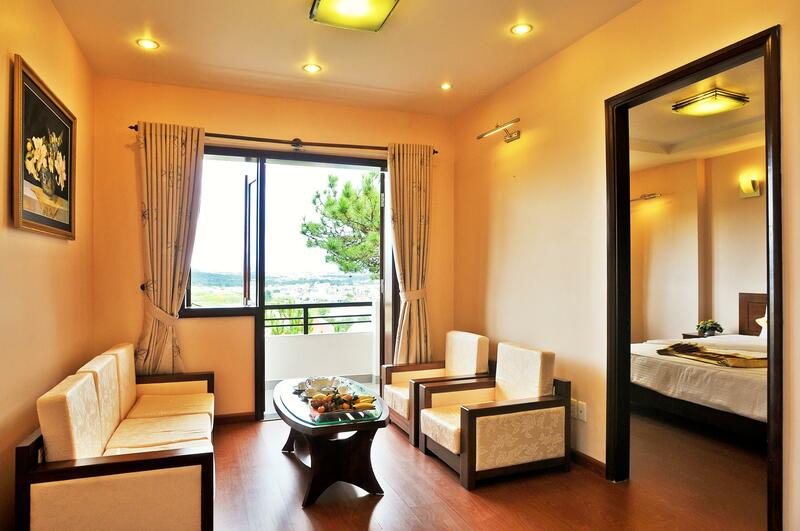 I have nothing more to ask for a peaceful stay in Dalat. Large rooms, nice view, cheap laundry service. I would not recommend staying at this hotel. The staff didn't speak much English, the breakfast was appalling (Spaghetti Bolognese for breakfast?) and the location was far out of town. 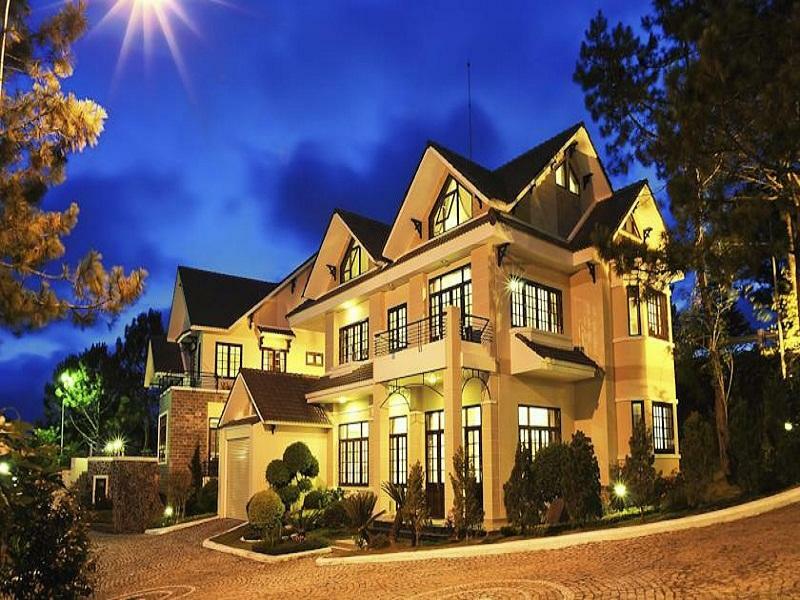 I stayed here because it was close to a conference at Dalat University but unless you have a specific reason to book this hotel, I wouldn't stay there. The shower only has enough hot water for one person, then you have wait while it heats up. Considering the great alternatives on offer in Dalat, my recommendation would be to look elsewhere. It took us a long time to find this hotel ,because the number of street in DALAT is too strange to konw.from the hotel to the center is abouut 4km and 70,000VND by taxi.the circumestance of breakfast is so terrible. the hotel is definitely further from the city centre. own transport or taxi rides are necessary for having meals or sight seeing . not much attraction around or near the hotel. the hotel is about 12- 15 mins drive from city centre . the hotel has 2 entrances if you are approaching from the city . the first sign is actually pointing to a longer small road leading to its back entrance. further down 500 metres is the main entrance which you can also see most of the hotel . they have a few different types of rooms. if you have a big group, then they have a few double story bungalow with 3 seperate rooms on the 2nd floor and a big living room and kitchen below . the standard double on the main building is the one with the nicest views . only 2 come with balcony, so it depends on your luck i guess. the rooms are nice and clean. as the rooms are facing unblock views , sometimes it can get very windy and cold. if it gets too cold, you can request for a portable heater at no extra charges. the breakfast buffet is kind of lacking for a nice 3 star hotel like this. very basic vietnamese food, not much meat. but at least they have bread,butter, jam and omelettes. the breakfast can definitely be improved, service of staff is good. hotel is located about 15 mins drive away from the city centre. not much sight seeing around or near the hotel . own transport or taxi is required . breakfast buffet is not up to standard for a 3 star hotel . although staffs are friendly and service is good. rooms are neat and clean . the hotel location is not adequately marked. we had problems to find it. it was a rainy,cold day and the temperature in rooms was rather low. the humidity was high. the hotel is marked as 4star here but on the hotel an acctual level is a 3 star hotel. The hotel is very beautiful, and the room as well. But the location is quite far from the city, not really a problem if you plan to hire a motorcycle and move around, but if you don't, then you need to spend extra money in taxi's (and extra time). We stayed there in August and it seems we were the only guests in the whole place. Not a problem if you want to be quiet and relaxed, but it could be creepy for some people. The breakfast is nice but maybe a bit too simple for westerns (two options: noodles bowl or bread with eggs), despite the last day of my stay they very kindly prepared some french fries for me (even if I didn't ask) as an extra to my breakfast. Staff was friendly and with a smile, but spoke nearly no English at all, only Vietnamese. The room was a bit cold and there was no heating system in the room. But there were some nice extra blankets in the wardrobe. Hot water in the shower runs off fast. Wifi signal was weak, so the internet is pretty slow. The bed is a bit hard. Plain spring matress, I guess. It's ok but could be better. There's no safe box in the room, despite they have one in the reception (just one for everyone, I guess). In general we were satisfied with the hotel. It's a beautiful place overall, and very calm, very clean, and with friendly staff. Good place for relaxation.